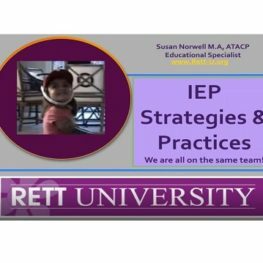 Watch this recorded webinar with Susan Norwell and learn the great components needed for successful IEP meetings for both professionals and parents. IEP goal ideas and strategies will be reviewed with a very comprehensive IEP Goal Bank provided as part of the full course. Use the IEP Goal Bank to build solid, foundational individualized goals that measure realistic growth vs. just focusing on assessment scores.